Today is our chosen departure day from Atlantic Yacht Basin. After four months of being land bound, we a little rusty on our boating routine. At first light, we slowly ease Idyll Time out of Shed 6, which has been her home since June. Our first stop is the fuel dock. A 90’ yacht has just pulled in taking up all but 60 feet of the dock. We squeeze in between the yacht and another Krogen with feet to spare. Diesel is the cheapest we have seen in years, $1.98 with a 5 cent discount for purchases over 200 gallons. We top off the tanks adding 300 gallons. There are five other Krogens on the docks, all heading south from the Krogen Rendezvous held in Solomon’s last week. 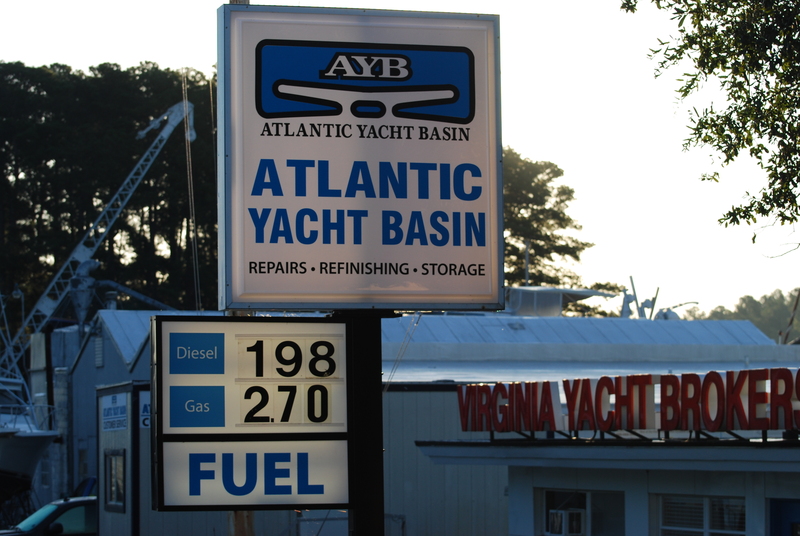 We say good byes to all the folks at AYB, as we ease away from the dock. You couldn’t ask for a better first day of travel. The winds are light and it is a beautiful crisp fall day. Four big go fast boats catch us while waiting on our first bridge of the day to open. 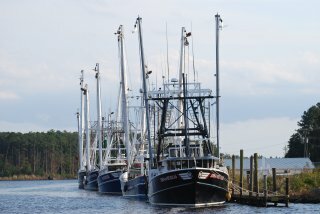 It is that time of year, and all the boats are migrating south. Through the bridge, they all rush past us in a hurry to make the next bridge five miles away which opens in 30 minutes. We push IT as hard as she will go but at 9 mph, we may not make the opening. A few miles later, we have the bridge in sight and see the four boats going through. We are still 5 minutes away. I call the bridge tender, and he says to hurry up (we have been) and he graciously leaves it open until we get there. Thank you bridge tender!! Wanting to get across the Albermarle Sound before the winds pick up, we bypass our usual stop at Coinjock and continue on. Their 30 ounce prime rib will have to wait until next year. The Albermarle can be one nasty body of water but today it is flat calm. Just as the sun is setting we find a spot off the Alligator River to drop the hook. This anchorage is wide open to any winds. The forecast is for light and variable winds so we should be OK here overnight. The rumbling of our anchor chain along with the wind generator coming alive was our alarm clock about 5 AM this morning. The winds have picked up out of the south west ahead of a cold front coming tonight. The Alligator River is starting to get lumpy. Our decision to cross the Albemarle Sound yesterday was a good one. The anchor is up at 8:00 AM and we are soon through the Alligator Swing Bridge. With high winds coming, we change our cruising plans today. We had planned on stopping around noon today at a nice anchorage but decide to push on and get more miles under the keel. Instead of anchoring, we will continue on to the Mayo Seafood dock 75 miles away. The thought of fresh seafood makes the decision easy. As we are transiting the Alligator River, we hear “Quotidian” calling out a “securite” that he is towing a disabled sailboat. A quick call on the VHF confirms our thoughts that we had traveled together while doing the loop six years ago in Canada. Boating is really a small community. 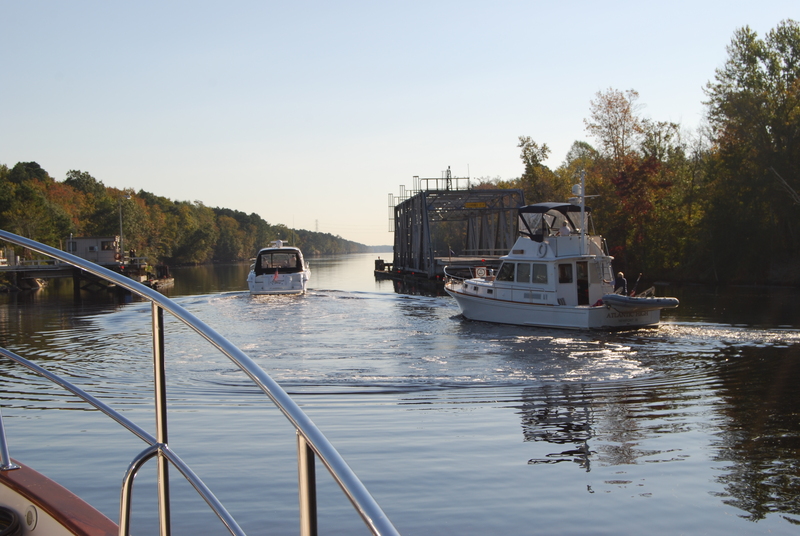 Traveling south through the narrow stump filled Pungo Alligator River Canal, we pick up the barge “Royal Engineer” on our AIS. Luck was with us today and we didn’t catch him until exiting the canal. 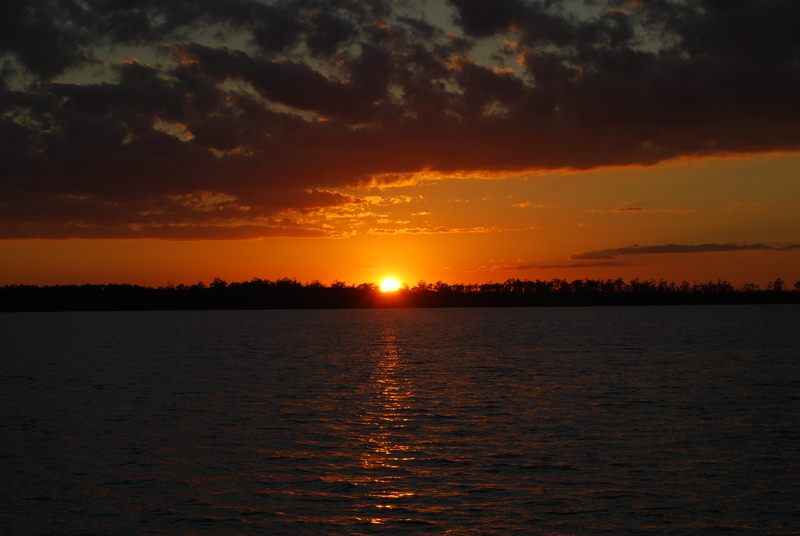 The wide expanse of the Pungo River makes for an easy passing. Crossing the Pamelco River, we follow the ICW into Goose Creek. 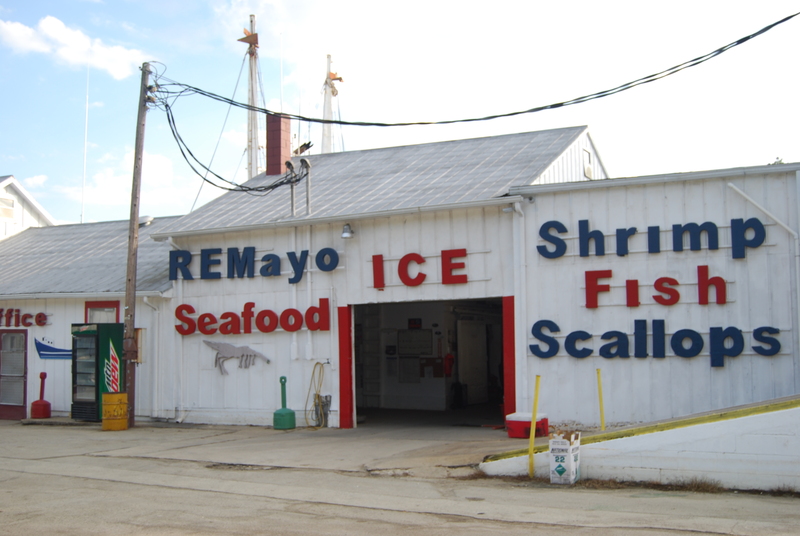 Our stop for the evening is at the R E Mayo shrimp docks. 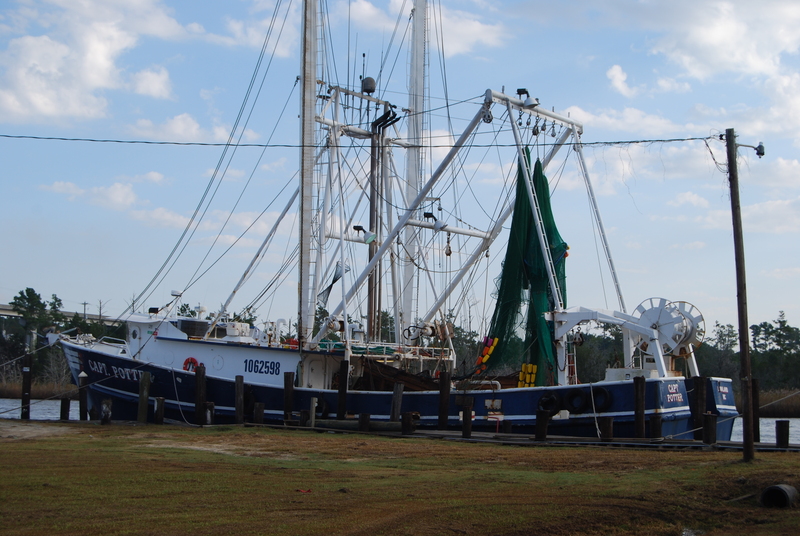 This is a no frills working shrimper operation. At 40 cents per foot, the docks are a deal. 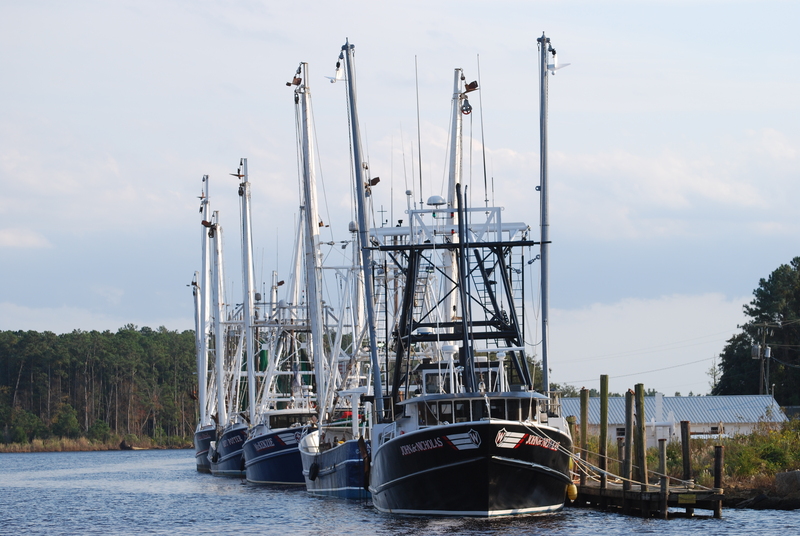 We tie up at the rustic wooden fixed docks just behind the fleet of shrimp boats. We arrived just in the nick of time, 15 minutes before the office closes. Three pounds of fresh shrimp along with frozen shrimp and scallops for the freezer are quickly snagged. 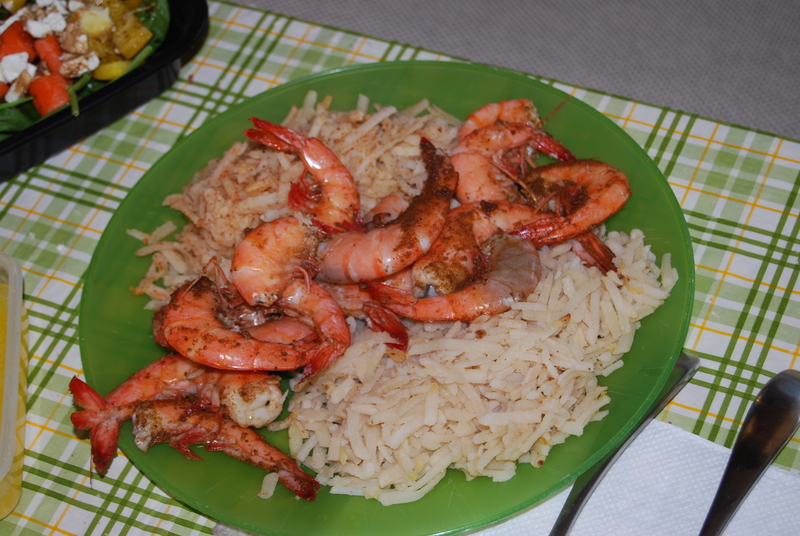 Dinner tonight is fresh shrimp and rice. It doesn’t get much better. We had a quiet evening here at the shrimp docks. The store closed at 5:00 PM and everything was locked up tight. 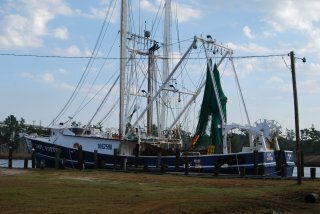 Other than a fisherman on the shrimp trawler docked behind us, we saw no one else. 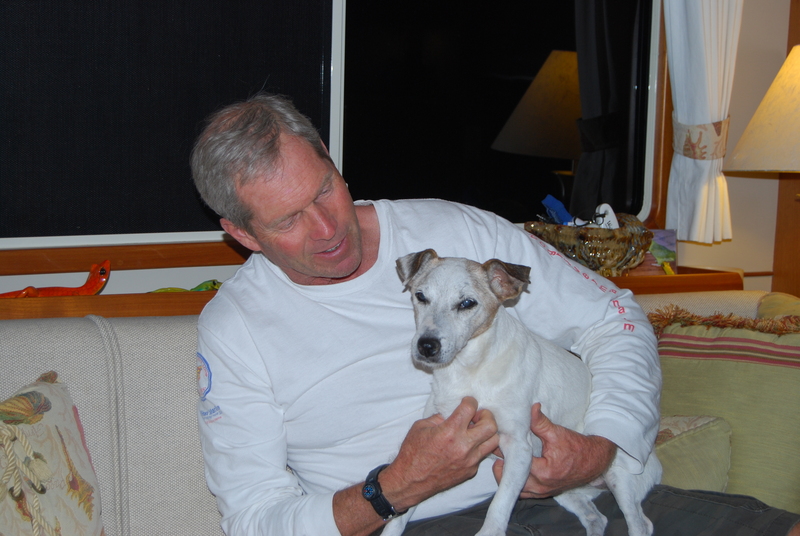 We are in no hurry today as we only have 20 miles to our next anchorage so we take Sebastian ashore for a walk. On our way back, the Mayo dockhand said we needed to move the boat. Two boats are hovering around IT wanting to buy some fuel. We weren’t expecting this. While Jeff quickly gets IT ready to leave, I run in the store for three more pounds of fresh shrimp. At $4.95 a pound, it is the best deal around. Back out on the water, we exit Goose Creek for a short trip down the Pamlico River to the Neuse River. Our destination for today is an anchorage in the South River. Once inside the narrow channel entrance ( there is a wreck just outside the channel marker), the South River opens up into a broad expanse of protected water. The winds are forecasted to blow hard for the next few days so we continue up river in search of a protected cove. Manny gets his first duty assignment as our anchor marker. 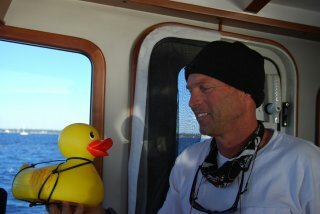 We attach his leash with 20 feet of line to the anchor so that he will float above it on the surface. Manny will mark the exact position of our anchor as the boat moves around. This information is helpful not only to us but to other boaters as well. 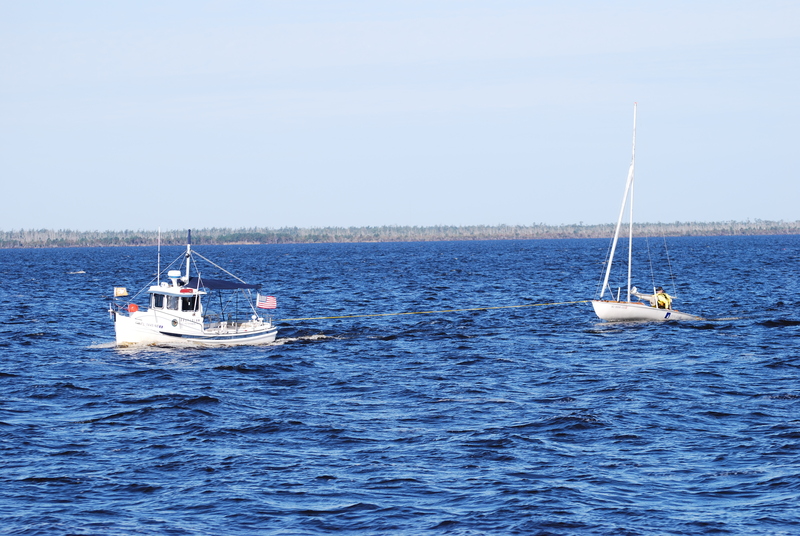 While in tight anchorages, we have had many instances of other boats dropping their anchor to close to ours. Because IT is so heavy, we deploy more anchor chain than most people realize. Manny’s first day on the job doesn’t go so well. He is having a hard time staying upright. He will need some adjustment to his leash. The South River turns out to be a great anchorage. The shore is undeveloped and we have only one other sailboat in the anchorage. With high winds and seas forecast for the next few days, we decide to stay put for two nights. 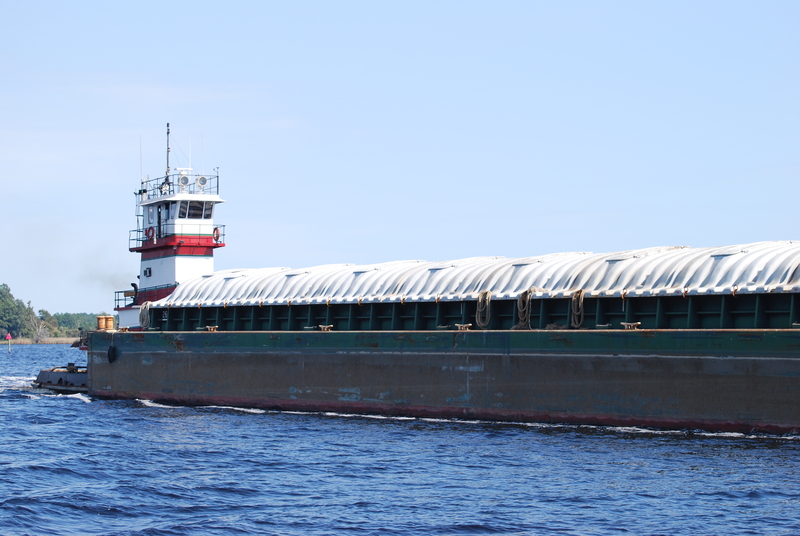 Most of the Krogen fleet passes us and head for Morehead City, 25 miles away. They are hoping to make an outside run tomorrow, avoiding the shallow ICW. The forecast is for 6-7 footers and gusts to 25 MPH. We certainly aren’t going out in that and I bet they don’t either. 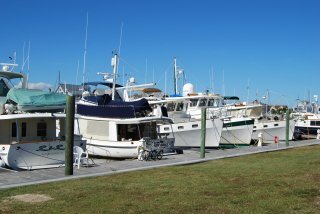 We make reservations at the Morehead City Marina for Monday. With all the boats moving south the marinas fill up quickly with the transient boaters. The dock master warned us that with the high winds, boats are not moving on. Even though we have a reservation, I worry that space will not be available when we arrive. A marina can not make boaters leave if the weather is unsafe. Our first night is quite windy and bouncy with gusts over 30 knots. We never get much sleep in conditions like this. 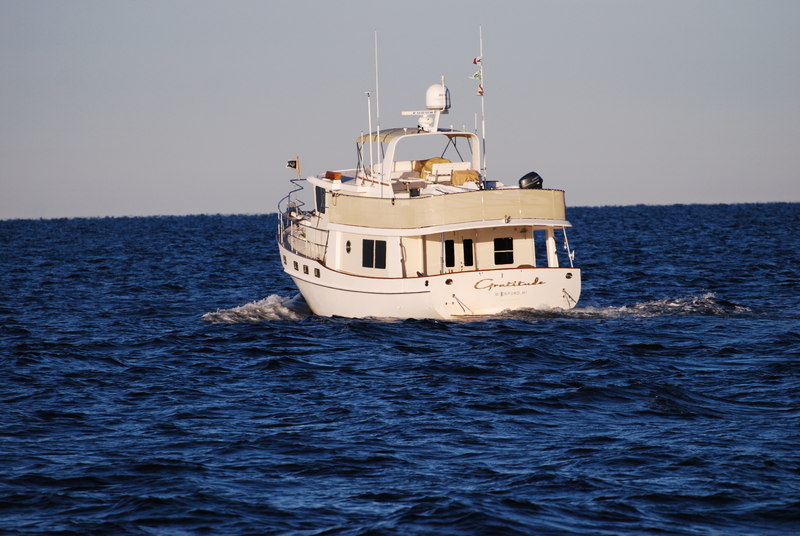 The winds ease up on Sunday and we have a nice day at anchor. Morehead City is our destination for today. Manny is happy to be retrieved from the cold windy water. It’s blowing like stink as we leave our protected anchorage. The seas on the Neause River are two to three foot on our starboard quarter. IT is rocking and rolling . Our stabilizers don’t seem to be working. While trying to diagnose the problem, Jeff realizes that they are still pinned. At anchor, we pin them so they will not flop around. We always put a sticky note on the stabilizer control head to remind us that they are pinned. For whatever reason the note was not there. Oops!! Once we unpin the stabilizers our ride smooths out considerably. Just shows you how valuable the stabilizers really are. After a short uneventful day on the water, we are soon entering the fairway to Morehead City Yacht basin. The docks are chock full of other Krogens who have been waiting on a weather window to run offshore. 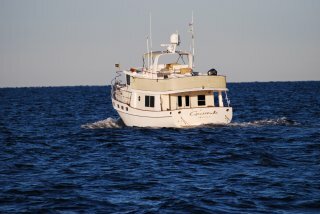 The current is running strong along with gusty winds but we manage to squeeze the fat girl in between two other boats. The other Krogen owners are all there to grab our lines. Sebastian has been really sick over the weekend so we have a vet appointment this afternoon. The marina has a courtesy car available for us to use. The vet puts Sebastian on several medications. We hope this helps the poor little guy. 5:00 o’clock is a Krogen get together up at the marina’s captains lounge. It is always fun to sit and chat with our Krogen family. There is group consensus that the weather looks promising for an offshore run tomorrow. We all plan on leaving just before sunrise. It’s a Krogen flotilla as we exit the Beaufort Inlet. We trail five other Krogens into Atlantic Ocean. Out on the water, we find the seas 1-2 foot, much better than the 7-8 foot seas over the last few days. Nate and Sebastian both join us in the pilot house for our 8 hour run and quickly settle in for the long day. 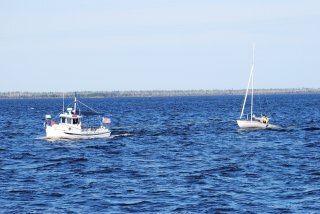 Several of the boats break away and head out to deeper waters. With a great weather window, they have decided to run overnight to Charleston. We follow Gratitude and Evergreen as they too are heading to Bald Head Island. The ocean continues to be tame all day and we have a most enjoyable day on the water. No fishing lines were deployed on this trip. We are just too lazy and the fishing doesn’t seem too great. We reach the Massonboro Inlet at 3:00 PM. Our original plan was to anchor here overnight, heading into Bald Head tomorrow. Our navigational program puts us into Bald Head at 6:45pm, jus t before dark. Discussing our options with the other boats, we all decide to push on to Bald Head. 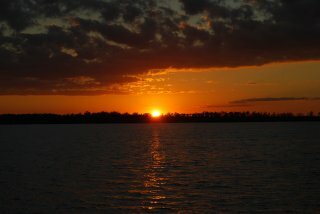 Once on the Cape Fear River, our arrival time drops to 6:15PM. We have a 2 knot current pushing us down stream. As we surf the current into the harbor entrance, we soon see 10 other Krogen’s already in their slips. Many helping hands are on the dock to catch our lines. On of the Krogen owners, Betty, owns a house here and is hosting a pot luck get together and Bon fire on the beach tomorrow. We will stay on the island for several weeks before continuing our journey south. 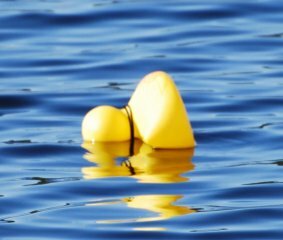 This entry was posted on October 31, 2015 at 7:36 pm. You can follow any responses to this entry through the RSS 2.0 feed. You can leave a response, or trackback from your own site.